They love their meat out in New York. Their commitment to burgers is second to none and the two I tasted were a mere dip of the toe in a rather large ocean. 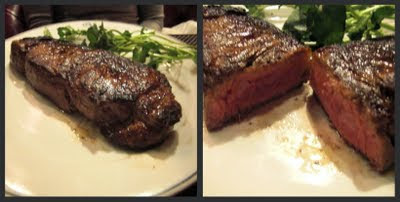 When it comes to steaks, the passion is just as strong and unfortunately, I only had one chance to fit a steak into my busy eating schedule. Word from the streets (also known as Twitter) said that the place to go was Lugers. 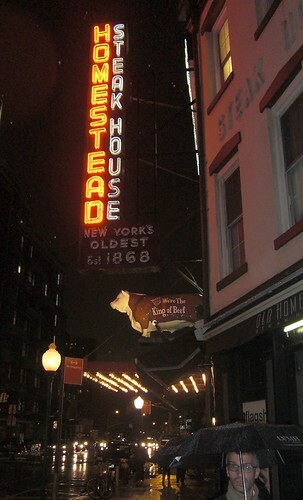 It's often foolish to ignore good advice, but after a few blogs were sent my way (check out Burger Conquest and the steak club 7) the best beef to be found in New York can allegedly be found at the Old Homestead. It claims to be New York's oldest steakhouse, having been around for over 140 years, and whereas most of London's steak houses often plaster the provenance of their cows all over their menus, I couldn't find where the cow I was about to eat grew up (either on the menu or the website). Although its interesting to know, all I really care about is the taste. After a rather monumental lunch at Momofoku Ssam (which you will be hearing about shortly), I decided to share an 18oz New York Sirloin with my cousin, accompanied by a mountain of sides. What arrived was indeed a great steak. Cooked a perfect medium rare, it was juicy and pink, but not a single drop of blood on the plate, a surefire sign of good resting. A thin strip of fat ran down one side, adding flavour and helping it to maintain that level of moistness. On the outside, a delightful gentle char. It certainly looked the business. The first bite was a beef explosion. Sounds disgusting, but I mean that in the best possible way. Juicy and full of flavour. It came "au naturel" with nothing more than a few leaves of watercress to keep it company, but it really didn't need anything. I felt almost guilty when I poured a dollop of the house steak sauce (somewhere between BBQ and ketchup) on the side, but it turned out to be the perfect accompaniment to the luscious steak. As you can tell, I rather enjoyed it. And I really should give the sides a mention. The onion shavings, creamed spinach and mash were unbelievably good, good enough to distract me from tucking into the glistening hunk of meat sat in front of me. So, in a nutshell, the steak is good. Very good actually. But if you go, be warned, bring a very healthy appetite. The steak I shared is normally a single portion. The two guys sitting next to us had the Empire cut Prime Rib and a Gotham rib steak on the bone, two absolutely monumental pieces of beef coming to a combined 52oz! They polished it off of course, but if that was for two, I shudder at how many cows they need in their aging room at any one time, just to cope with demand. Mark - hahaha, I thought Euwen never publishes your negative comments? Euwen - I'll have some of that 'beef explosion'. Sometimes I feel like London is so far behind everybody else. Hurrah! I first ate at Ol Homestead in 1999 during short stint in NYC and have been sending people there since. Am absolutely delighted to hear from you that in the decade since, it hasn't lost its lustre. This brought back lots of lovely memories. Thanks! @Mark - Yes, sorry. You were my steak research monkey, thanks! @Kang - I think London is certainly moving in the right direction but NY has a massive headstart. @Wen - I will definitely head to Lugers next time, mainly to see what the fuss is all about! @Lizzie - They really know meat, thats for sure.